The Department of Community Health Nursing, KLEU Institute of Nursing Sciences Belagavi, had organized a Guest Lecture on “Alcohol and Drug Abuse: Attitude of Youth” for the Nursing Students of KLEU Institute of Nursing Sciences, Belagavi on 23rd April 2016. 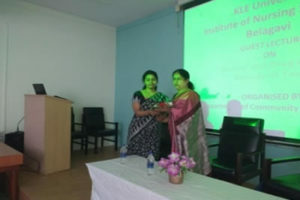 The Expert Lecture was delivered by Dr.Shobha Karikatti, Associate professor, Belgaum Institute of Medical Sciences, Belagavi. After the lecture the forum was open for queries to clear their doubts. 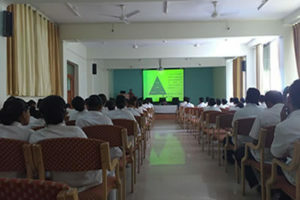 Total 120 Nursing Students were benefited by the guest lecture. 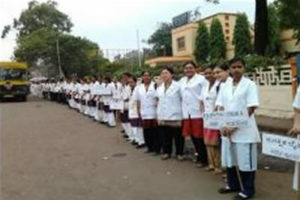 All the faculty of Department of Community Health Nursing along with B. Sc (N) 2nd year, and P. B. 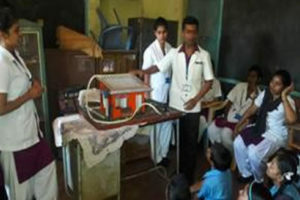 B. Sc (N) 2nd year students were participated in this program. KAHER Institute of Nursing Sciences Department of Community Health Nursing organized a Health Check-up camp for Industrial workers at Auto Nagar Industrial Area Belagavi on 28th September 2018. 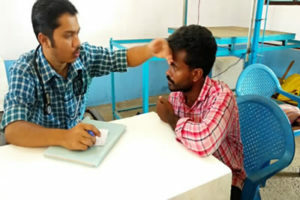 Total 65 Workers from Jain engineers and Uday Industries were screened, out of which 08 were Diagnosed with Hypertension & 06 with Blood sugar 4 with Mild Anemia, 2 Blurred Vision, skin allergy, minor ailments cases were treated, Medicines were given & 3 cases were referred to Dr. Prabhakar Kore Charitable Hospital & MRC Belagavi for further treatment. 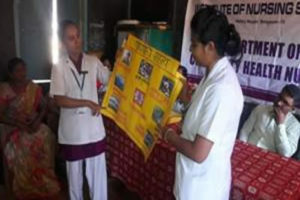 Health education was given by final year PBBSc Nursing students & Staffs from department of community health nursing on importance of maintaining good health, Diet, Occupational Health Hazards & Protective measures etc. After the programme forum was open for discussion. 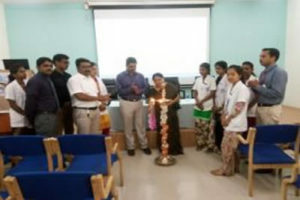 Department of Community Health Nursing HOD Mrs.Namrata Devulkar and faculty Mr.Shivaraj D, Mr.Somshekhar K, Mr.Sanjeev B, Mrs.Chandbi and Ms.Jyoti were present with Dr.Vinayak from community medicine department of JNMC. KAHER Institute of Nursing Sciences, Department of Community Health Nursing had organized a Breast Feeding Week for the antenatal and postnatal mothers at UHC, Rukmini Nagar Belagavi on 9th August 2018 on the occasion of World Breast feeding week. 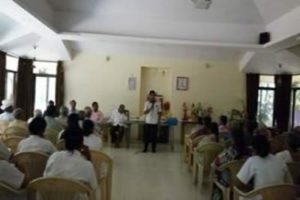 The programme was inaugurated by Dr. Soudagar, Medical Officer UHC, Rukmini Nagar Belagavi. 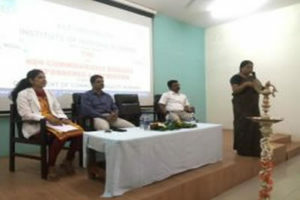 Mr. Sanjeev Badli, Mr. Basavaraj G, Mr. Cyril P, Ms. Jyoti G staffs, Department of Community Health Nursing, KAHER Institute of Nursing Sciences Belagavi participated in the event. 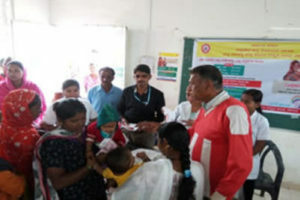 Health education followed by Poster Exhibition was executed by Mr. Basavaraj G Junior Tutor on meaning of Exclusive Breast Feeding, importance, advantages, different positions for breast feeding .After the health talk the forum was open for queries to clear their doubts. New born cloths were distributed to Antenatal & Postnatal Mothers. All the staffs of department of community health have participated in the programme. Around 5 Anganawadi Teachers, 50 Antenatal & Postnatal Mothers were benefited by the programme. 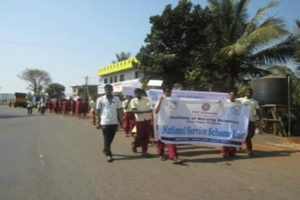 As a part of NSS (National Service Scheme) Program, Dept. of Community Health Nursing conducted Malnutrition Survey Program for Anganwadi Children in Vantmuri Village on 21-09-2017. 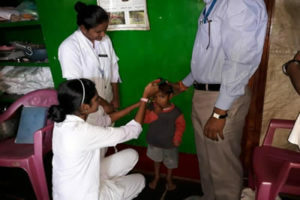 Total 122 children were surveyed and basic parameters like height, weight and mid-arm circumference (MUAC) was assessed. 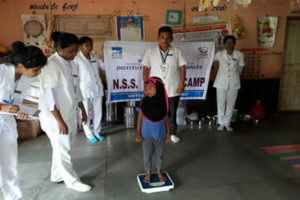 Out of 122 children who were surveyed, only 4 of them were found to have moderate malnutrition where MUAC calculated was less than 11 cms. Total 5 Anganwadis were there in the village. No children were reported with severe malnutrition. The department of community health nursing aims to prepare nurses to assume responsibilities as professional, competent nurses in providing promotive, preventive, curative and rehabilitative services to the community. Community Health Nursing, now more than ever, is a challenging, evolving field of nursing practice-one that is on the cutting edge of many innovations in the health care delivery. Community Health Nursing represents an effort to introduce and elaborate upon the basic scope and nature of contemporary community health nursing practice. It is a field of nursing practice, which blends primary health care and principles of nursing practice with public health nursing. 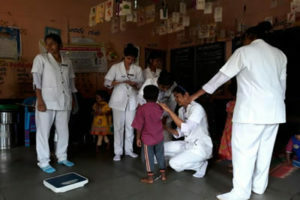 The department of community health nursing is intended to mould fully pledged community health nurses, who are ready to serve the patients at any place and at any time by applying the principles of community health nursing. The department of Community health nursing is enthusiastic to provide quality education to students in graduation and post graduation level, under the supervision of excellent faculty. Moreover, the department takes great interest in conducting public health research and community welfare programmes. The department has promised to facilitate both professional and personal growth in the students and the faculty by encouraging and supporting their participation in continuing educational activities. The department has a fully equipped community health laboratory which accommodates 50 students at a time. This is used for the preparing for the activities during the field visit and to train students. External Posting: Students are also posted to PHC, CHC and various sub centres for observation and regular posting. Community health activities: Regular home visits, Health need assessment, Family coping, Health Awareness and activities concerned with public interest and also social activities. KLEU’s Institute of Nursing Sciences, Department of Community Health Nursing had organized a health awareness programme on the occasion of world Environmental day at Ramnagar on 5th June 2017. 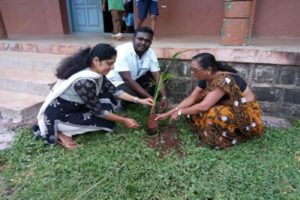 Trees were planted in the premises of Government Kannada, Marati & Urdu Primary School, Ram Nagar, Belagavi. Department of Community Health Nursing had organized and conducted Health education program on Geriatric Health Problems & its management in Shantai Old age home Belagavi on 24th March 2017. 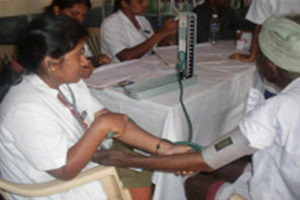 Beneficiaries: 37 Geriatric People were benefited by the programme. Department of Community Health Nursing had organized and conducted Health education program on the occasion of world Water day in Ranakundaye village Belagavi on 22nd March 2017. Rally & water awareness programme was organized with the help of Govt. Primary Marti School Ranakundaye village in order to create awareness among the villagers regarding importance of water, its utilization, storage and about rain water harvesting. Health education programme was organized in the Govt. 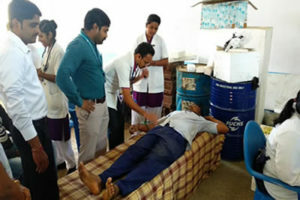 Primary Marti School Ranakundaye by 2nd year PBBBSc Nursing students and staff Department of Community Health Nursing with the help of A.V.AIDS. Snacks were distributed to students. A one day CNE (Continuing Nursing Education) on “Non Communicable Diseases – Approaches & Prevention” was organized by Department of Community Health Nursing, KLEU Institute of Nursing Sciences, Belagavi on 17th February, 2017. The Objective of this CNE was to sensitize students regarding the burden of Non Communicable Diseases, the risk factors associated, approaches and methods to prevent these diseases in the community by proper health education to the people. The program began with inaugural function at 10:00 am. The CNE was inaugurated by lighting the lamp by Chief Guest Dr.R.G.Viveki, Professor & HOD, Community Medicine, BIMS, Belagavi & Prof.Dr.Sudha A.Raddi, Dean & Principal, KLEU INS, Belagavi. Mrs.Namrata Devulkar welcomed the guests which was followed by lectures. The Resource Persons for the CNE were Dr.R.G.Viveki, Professor & HOD, Community Medicine, BIMS, Belagavi, Mr.Shivarajkumar.Dandagi, Asst.Prof & HOD, Community Health Nursing, Mrs.Namrata Devulkar, Asst. 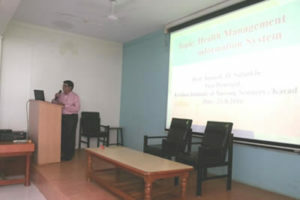 Professor, Mr.Laxmikanth Bhangennavar, Sr.Tutor & Mr.Sanjeev Badli, Sr.Tutor. Prof.Dr.Sudha A.Raddi gave the presidential remarks. Vote of Thanks was proposed by Mr.Shivaprasad Kamat, Jr.Tutor. 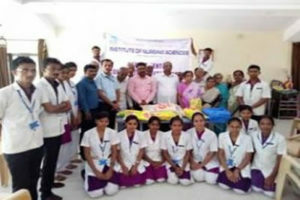 Total 180 delegates, students, faculty from BIMS College of Nursing, KLES Institute of Nursing Sciences, Ankola & KLE Academy Of Higher Education and Research’s Institute of Nursing Sciences, Belagavi participated in the CNE. NSS unit of KLEU’s Institute of Nursing Sciences along with Department of Community Health Nursing organised a Health Check-up camp for Antenatal Mothers at Ashok Nagar UHC Belagavi on 17th October 2016. 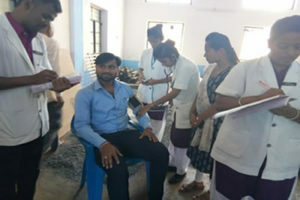 Department of community Heath nursing in collaboration with UHC Ashok Nagar carried out the general health check-up camp. Total 24 Antenatal Mothers were screened, of which 13 had Mild Anaemia (10Hb %), Moderate 10 (8Hb %), Severe 01 (Below 6Hb %), & 01 High Risk case detected (short Stretch). 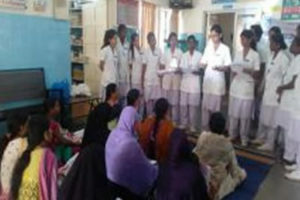 Health education was given by final year BSc Nursing students & Staffs from department of community health nursing on importance of maintaining good health, Diet, breastfeeding techniques etc.. After the programme forum was open for discussion.Medicines were given to those who were sick. Fruits were distributed after the examination. Copyright 2018 | Developed By Inventica Technologies.